For this weeks ‘Food Talk with Mackenzie’ (F.T.W.M) I am going to talk about PAX Burger. A place everyone raves about, somewhere I raved about, until my visit last Friday. 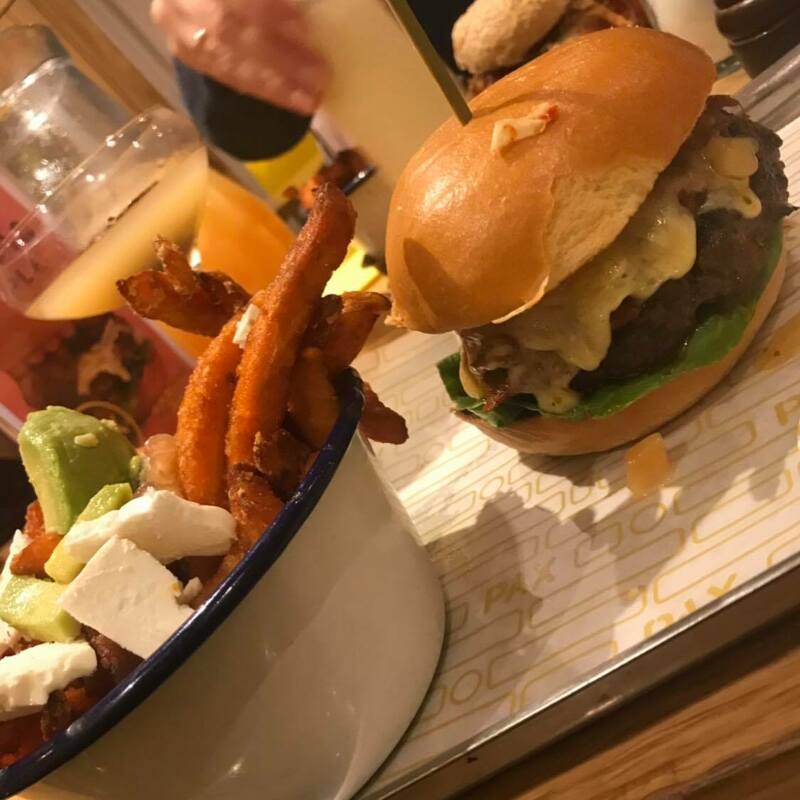 Pax Burger is situated in Lindley, about a 10 minute drive from Huddersfield town centre and about a 20 minute drive from Halifax. There is parking on the street outside PAX or on the streets around the back of it. However, parking is limited and at busy times almost impossible to find a spot. On my first visit I went with my sister and it was fantastic. It is a very cute restaurant, not huge, with a really friendly atmosphere. We were seated upstairs and I couldn’t wait to try their burgers and shakes. We both ordered a milkshake, which was huge, creamy and delicious. Possibly one of the best milkshakes I have ever had, and I am not a huge milkshake fan. But I sure am now after trying theirs. My sister ordered their double chocolate fudge, and I got the strawberries and cream, I would highly recommend them both. For burgers, we ordered the ‘PAX A PUNCH,’ which is a beef patty, cheese, gem lettuce, tomato, smokey BBQ pulled ox cheek, house ketchup and spicy mayo on a Brioche Bun and also their ‘SMOKEY JOE.’ Which is a beef patty, BBQ pulled pork, jerk mayo, pickled onions, white cheddar, gem lettuce, tomato and PAX ketchup, which is also served on Brioche Bun. All burgers are available without the bun with extra salad, a brown seeded bun or even a gluten free bun, which is great! Their burgers come with salt and pepper fries which are some of the best in town, or they can even be upgraded to sweet potato or their loaded fries. PAX’s burgers are all served medium rare, unless you ask for it cooked differently. They came cooked to perfection, juicy and packed full of flavour. Every mouthful was so amazing, even down to the sauces! We also ordered a portion of onion rings, I don’t even know where to start with these, the BEST onion rings, ever! Melted in the mouth! After my first visit I couldn’t wait to rush back and I had to take my foodie friend, Sarah. We were both really excited, from myself and everyone hyping it up all over social media. When we got there we were seated downstairs, and they were super busy so we expected a wait, which we were fine with as we had so much catching up to do. The time flew by anyways. When we sat down we were asked if we wanted to order any drinks, so of course, we had to try the Pornstar Martini Sharer. A huge jug of our favour passionfruit cocktail served with a side of Prosecco, for only £19. This was super yummy and great value for money. We got 3/4 drinks each out of it, which is amazing when one usually costs around £8/9. Sarah decided to order their ‘‘LICKY LIPS’ CHICKEN BURGER,’ a southern fried buttermilk chicken, cheese, kim chi slaw, pickled cucumber, gem lettuce, tomato, rosemary and garlic mayo, house ketchup usually served on a brioche bun, but Sarah decided to change hers to a brown seeded bun. When it came it smelt amazing, however she was very disappointed in the flavour, especially the chicken. ‘Initially I was impressed as the sauce was lovely, and slightly spiced, and the brown seeded bun was great, however the chicken was bland and lacked a lot of flavour. I was also under the impression that it was properly a quiet cheap cut of chicken as it was very pink with a few blood veins, which to be honest was very off putting and therefore I left some. I would however say that the sweet potato fries were some of the best I have ever had’ – Sarah. I decided to try their new Autumn special burger, ‘THE PIG APPLE’, which looked great on the photo they had recently uploaded on to Instagram. Its only available for a limited time, so I had to order it. I even upgraded my fries to a loaded fries, which were also recently advertised on their social media. ‘THE PIG APPLE” consists of a beef patty, confit belly pork, apple and scrumpy relish, smoked applewood cheese, plum tomato, PAX ketchup and gem lettuce, all served on a brioche bun. I also upgraded to the ‘VEGGIE FRIES’ which are sweet potato fries topped with feta cheese, avocado chunks and pomegranate seeds. When it can it looked great, however I wouldn’t really call them ‘loaded’ fries, as they had a pinch of pomegranate seeds and about 4 pieces of feta and avocado, really not worth the £3 upgrade! Then for the burger, as soon as I went to try it I could tell something wasn’t right. The menu stated that it was a confit belly pork, which you can see on the Instagram photo above. However I instantly smelt BBQ, which wasn’t stated and realised that they had topped it with BBQ pulled pork instead of the pork belly. So, of course I asked the waiter if this could be changed as it wasn’t correct. He also agreed with me as there was also photo of it on the specials menu on the table. On his return, he told me that the chef had made the right thing and wasn’t going to change it, however it was clearly wrong. However I was too hungry at this point to make a fuss so was happy to eat it anyways, but it was so disappointing. The burger was well done and not medium rare, so was super dry and pretty tasteless, and by that point I was too fed up to complain. Other than that, the pulled pork I was given was actually really tasty and of course the sweet potato fries were amazing. I can’t fault the friendly, apologetic service we were given and I am really hoping it was just a bad day, as they were super busy and rushed of their feet. But they don’t get a 10/10 for consistency from me. Hopefully it is better when I next visit. Hope you enjoyed my very honest review on Pax Burger, I shall be giving it another go in the hope that they were just having a bad day as I loved it the first time.